The tradition of cultivating olives and producing olive oil on Majorca goes back hundreds of years. Majorcan olive oil is won solely through mecanical, not chemical, processes.The thus obtained pure olive juice with its high content of vitamins an unsaturated fatty acids is a high-quality wholefood product. Its culinary diversity, the exquisite flavour and its manifold aromas stimulate all senses. The designation of origin "oli de Mallorca" warrants the oils quality, its aroma and texture. 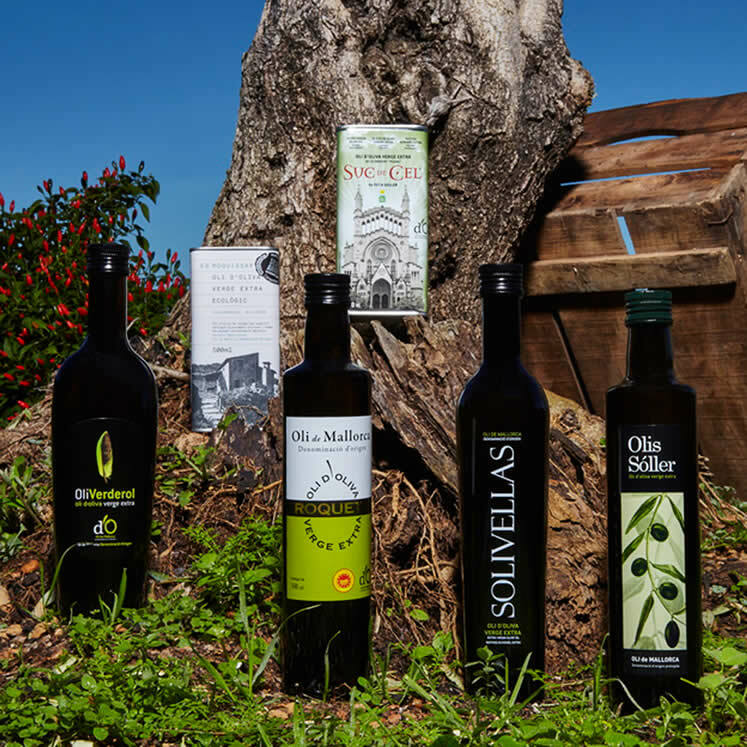 Get to know the distict properties of Oli de Mallorca with this selection of some of the islands best olive oils, all carrying the title "Protected Designation of Origin". Oli Solivellas, Oli de Roqueta, Oli Jornets, Oli Duntemps, Oli Verderol, Olis Sóller. A mild, fruity olive oil from the finca "It Guinyent" Alcudia. The taste of ripe, freshly pressed olives is accompanied by the flavours of almond, walnut, mint, artichoke and fennel. A high class, authentic Oliveoil of the Arbequina variety, fruity, with a slight notion of bitter and spicy flavours. The family-run company Jornets is based in the town of Sencelles. In the jear 1998 they started cultivateing the Picual olive. This fruit, with its singular flavour produces a slightly bitter and peppery oil with a high content of unsaturated fatty acids. The longer the storage time of this oil, the milder its taste. A genuine oil from the Arbequina olive with a fine aroma of artichoke and nuts. It is produced in the oil mill of Son Cuixa by traditional mechanical method without chemical processes or additives. The basis for this extra virgin olive oil is the olive variety called "Arbequina". It stands for an aromatic, mild and somewhat sweet taste. The cultivar ‘Picual’ gives this olive oil a slightly spicy touch, while a small portion of the olive variety "Mallorquina" adds to the Mallorcan character. Extra virgin olive oil of highest quality, freshly pressed and bottled in Sóller. Fresh, aromatic, slightly sweet olive oil in the dark bottle.